The Boeing B-50 Superfortress was a post-WWII derivative of the B-29 Superfortress. It had a larger tail fin and more powerful 3,500 h.p. Pratt & Whitney Wasp Major engines. Significantly faster than its predecessor, it could carry more payload at higher altitudes (35,000+). 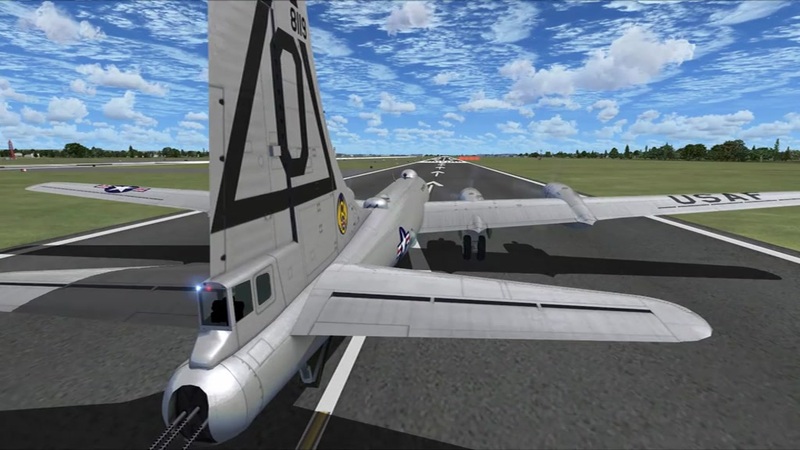 In the simulator, you can fly the aircraft either as an 'A' type (using a B-29 type glass cone) or as a 'D' (and later) type, both with or without long-range tanks. Three liveries are provided for the exterior model, while the interior model, in this version, is largely provisional only, cannibalizing various parts of Team Strat's C-97 model. Gun turrets are moveable either from the Shift-4 'Monitor' panel or, in P3D, by mouse-clicks. Created by 'Team 50' - models, textures and Monitor gauge by Manfred Jahn, sound set by Ted Wolfgang, and research, testing and tweaking by Marc Roth. The flight dynamics are largely based on the 'generic' C-97 design originally created by Wayne Tudor (RIP). Even though only one model file is included, you can access four variants and freely assign any of the liveries in the aircraft.cfg. If the title= line contains the string "(A)", the model will display the A type nose, if there is a "(D)" the plane will have the D type nose, and if you specify "(ALR)" or "(DLR)" the plane will additionally be fitted with long-range tanks. If the title line contains no version specifics, the model will have the A type nose and no long-range tanks. Minimum system-requirement is FSX SP2, P3D V3 tested and recommended. Some small issues aside, the plane is flyable in P3D V4, too (see below). Copy the zip's "Boeing_B-50" folder to your flight sim's "SimObjects\Airplanes" folder. Copy the contents of the folder "Effects" to your flight sim's root "Effects" folder. As always, on first loading the plane, you will be prompted to accept certain gauge modules as trusted software. These are widely used FS modules (see credits, below). It's fairly safe to click accept. Folder "Extras" in the zip contains a basic Paintkit and two AI ground vehicles (a Follow Me Jeep and a Crew Bus). Instructions on setup details can be found in the respective subfolders. (1) Use the 'Monitor' gauge (Shift-4) to handle most aircraft functions. Click the Help buttons in Monitor to show help screens for the subpanels. Get individual tooltips by hovering the mouse over click spots (you may need to be in the windowed mode to see them). Note that some of the Help placards still refer to original placards found in the C-97. Note on abbreviations: "L", "R", and "mid" in Help screens and tooltips refer to clicking the left, right, and middle mouse buttons, respectively. (2) Flying tips. Click Monitor > Misc > Chk to call up the standard checklist. (3) Key assignments. Ctrl-W or whichever key or button you have currently assigned for 'water-rudder' will first arm and then trigger some very powerful engine reversing. Click again to toggle it OFF. (4) Crew Calls have now been set ON by default. To turn them off, unclick the asterisk on the loudspeaker icon at the bottom of Monitor > Flight. The crew calls are editable wav files in Boeing_B-50\panel\DSDSounds\. See file 00__dsd_fsx_xml_sound.txt for help. Altitude callouts have been implemented for 500, 400, ..., 100, 50, 40, 30, 10 feet AGL. (5) Automixture (in FS Settings > Realism > Engines > enable auto mixture) may be left on or off. If OFF, you will get sim prompts when changing altitude. You can then either adjust mixture manually or mid-click Monitor > Engines > Mixture value for "set best". nose wheels: show/hide ground equipment (GPU). Sometimes the cockpit windows cast an odd reflection on the fuselage (if you know a reason or cure for this, let us know). The archive boeing_b-50v1.zip has 513 files and directories contained within it. A really cool looking B-50 Series. Flies like a slightly underpowered recip bomber should, but when it's lightly loaded, it climbs 1000/min easy and turns very tightly. If it is heavily loaded, make certain you manually push the throttles to take off (military) power or you might eat those trees at the end of the runway. I am so happy to find this site, and download the B50 Aircraft, This program should be payware, top value! I would hope it could be the Tanker version, KB50J. Also it would be great to fly it in the XPlane Format. I would need the FSX GPU..... I am an old, retired Flight Engineer (one of the few remaining) 85 and still counting.....I was a crew member, assigned to the 431 AREFS Biggs AFB TX. I am still a Life member of the TAC Tanker Assoc. You are welcome to check out the web site. I have a great Flight Simulator, built by Jet Lines Systems. The B50 Plane flys great....! I would love to contact the developers of this program. I have a lot of material om the KB50 Aircraft...... Lots of luck to all of you. I hope you love flying as munch as I do! Best Regrards, Fred R Duck, Retired SMS USAF. Absolutely astonishing work! i would recommend this marvelous masterpiece to be payware level! It would be amazing if we got a Kb-50 version and one that had Macdill colors on it. Perfect plane and excellent quality, copilot voice in landing and other actions sound great, maybe only need almost realistic panel control in VC, excellent dynamics, response good, the gun turrets rotation and the guns up down is a improve over many planes. 5 stars. We welcomed screen controls that gradually replace the monitor falt panel. Great plane. Flies well. Nice sounds. VC looks sparse, but the "monitor" gauge works as promised. I enjoy the plane. For a freeware plane, this is very good. Very good quality. I give it a thumbs up. Thank you very much. Simply fantastic. An impressive work, in all aspects.